January 28, 2019 – Dry weather and mild temperatures continue today. Low chances for precipitation Tuesday and Wednesday with increasing chances late this week into the weekend. Plenty of high clouds continue to spill into NorCal through the upper ridge centered just off the West Coast. This has helped to inhibit fog formation across the Central Valley as temperatures are milder and humidities are lower compared to 24 hours ago. Another day of dry and mild weather is on tap for the region. Highs today are expected to be down a bit compared to Sunday`s with thicker cloud cover across much of the region. A few showers will be possible late tonight and Tuesday as a weak short-wave trough traverses the area. Moisture with this wave is mainly limited to the mid and upper levels, so best prospects for showers will be across the higher terrain with perhaps a few sprinkles across the valley. Better chance of precipitation returns to the region Wednesday and Thursday as the low presently near 40N/150W drops southeastward parallel to the coast. 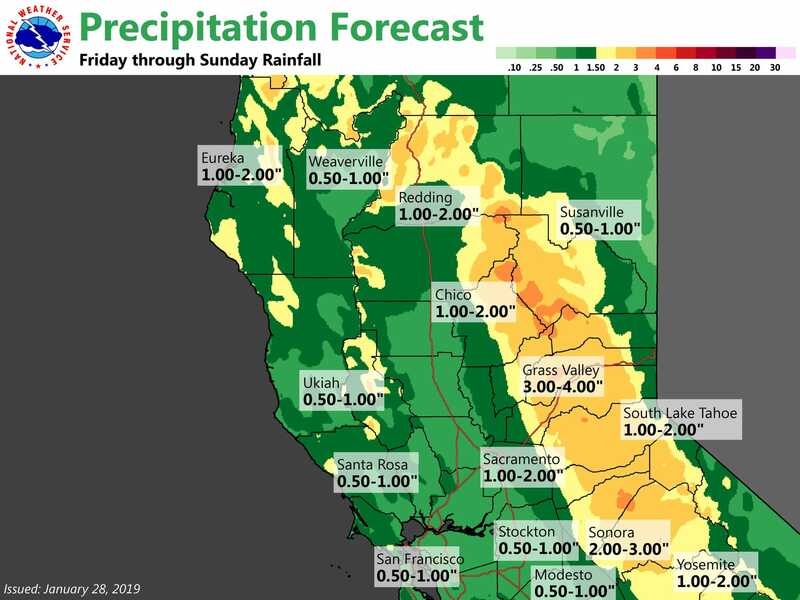 At this point, it looks like most of the QPF (less than half an inch) will occur from the Central Valley westward while lighter amounts will fall further east across the Sierra Nevada. 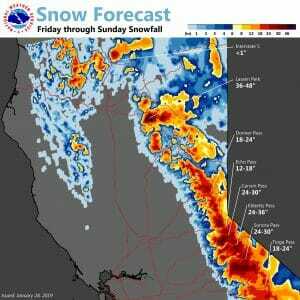 Snow levels forecast to be above 7K feet with little impact to travel expected. 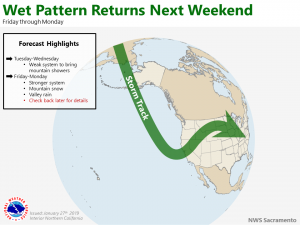 Based on the latest guidance suite, it appears likely the start of February will be wet in response to an approaching longwave trough. As shown by the 00Z GEFS members, the atmospheric river event will likely be in the “Weak” category. Rather strong height falls accompany this trough passage as the upper low nears the Northern California coast by early Saturday. This is based on the slower/deeper 00Z ECMWF while the more progressive 06Z/00Z GFS solution arrives roughly 6 hours earlier. All and all, expect increasing precipitation chances by Friday morning with the GFS favoring some locally heavier amounts focusing Friday afternoon/evening. 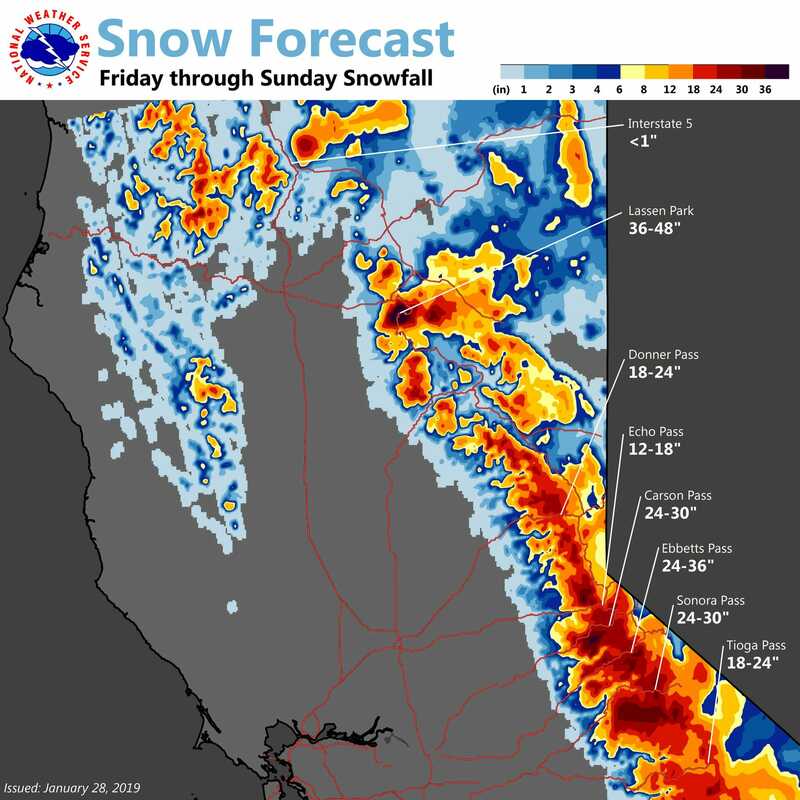 Snow levels across the mountains should remain around 5,000 to 6,000 feet during this first storm. Besides the precipitation threats, some gusty southerly winds are possible if the offshore surface low substantially deepens. By Saturday, some lingering showers will be possible given cooler, unstable air aloft moves through. 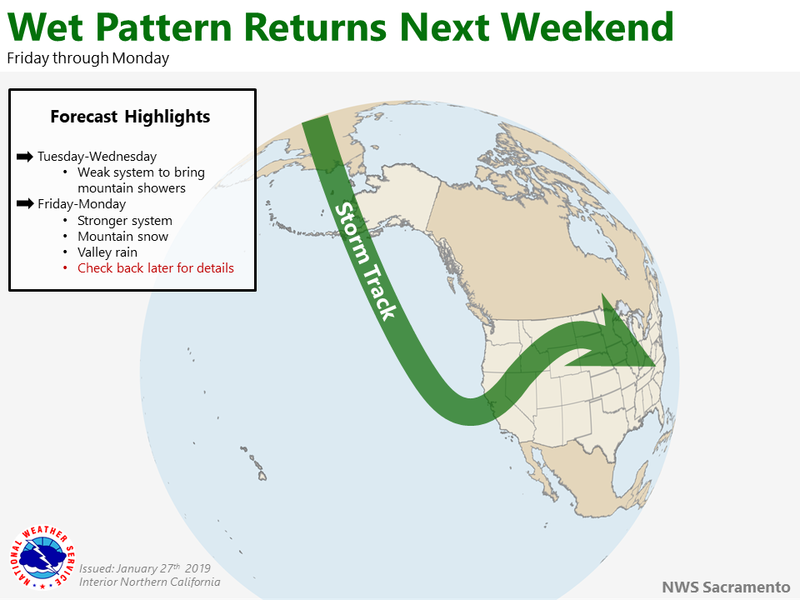 There will be a brief lull in the precipitation before a trailing upper low potentially impacts Northern California on Sunday. While the GFS/ECMWF agree on its existence, they vary in its strength and path. Most notably, this could be a much colder system as 700-mb temperatures may drop below -10C. This would favor dropping snow levels down to around 3,000 feet or a tad lower which would bring snowfall into the foothills. Much could change with this system but this is how it looks at this point. Valley high temperatures are being forecast to stay in the mid to upper 50s, but these could be lowered if the system stays as cold as advertised.